This surprisingly simple recipe to make chocolate dipped strawberries has some expert tips to help you achieve the best possible results. Once the strawberries are coated with chocolate, you can decorate them with Valentine sprinkles or, once the first layer of chocolate is dry, you can drizzle the strawberries with a contrasting chocolate color. However you serve them, chocolate dipped strawberries are a perfect offering for any Valentine. Wash strawberries and pat dry, leaving stems and leaves intact. Strawberries should be completely dry before proceeding with the recipe. 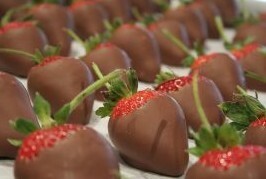 Hold a strawberry by the stem and leaves and dip it into the melted chocolate. Withdraw the strawberry and swirl it in a tight circle to spin off excess chocolate. If desired, shake sprinkles or small candies over the wet chocolate coating. Place the chocolate dipped strawberry on the wax paper and set aside to dry. A cool room temperature is preferable for drying. Repeat with the remainder of the strawberries, reheating chocolate for a short time, if necessary, to keep the coating consistency. If possible, dip and serve the strawberries on the same day. Once dry, you can place each strawberry in a small paper candy cup.